Never signed up for Part B and losing your Employer Coverage? If you are losing group benefits and never signed up for Medicare Part B, you need to know what happens now. You have 8 months to sign up for Part B without a penalty. • If you choose COBRA, don't wait until your COBRA ends to enroll in Part B. The reason for this is that COBRA is not considered “creditable coverage”. If you wait to sign up for Part B you may wind up paying a penalty of 10% per year for every year that you did not have creditable coverage. Remember: COBRA IS NOT CONSIDERED CREDITABLE COVERAGE. 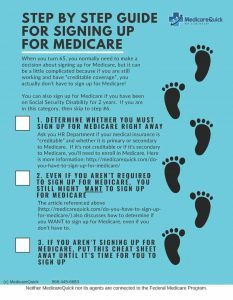 If you never signed up for Medicare Part B you may pay a Penalty. Keep in mind that the 8 month window begins either when employment ends or when group coverage ends, WHICHEVER COMES FIRST! So if you wait until COBRA ends, not only will you incur a penalty, but also the 8 month window will have long ended, so you will have to enroll 1/1 – 3/31 and wait til 7/1 for coverage. Keep in mind that the penalty you pay is for life, it is not just a “one time” penalty. • If you don't enroll in Part B during the 8 months after the coverage ends, you may have to pay a penalty for as long as you have Part B. This is because COBRA is not considered creditable coverage, so if you never signed up for Medicare Part B you may pay a Penalty. • If you don’t enroll during the 8 month window you won't be able to enroll until January 1–March 30, and your coverage will not begin until July 1st. This means that you might not have health insurance coverage at some point. Let’s say that your COBRA ends on April 30th. You would have to wait until January to apply for Medicare Part B, and then the coverage would not go into effect until July 1st. In this scenario, you would go from May 1st until July OF THE FOLLOWING YEAR without Part B insurance. If you become eligible for COBRA coverage after you're already enrolled in Medicare, you must be allowed to take the COBRA coverage. It will always be secondary to Medicare (unless you have End Stage Renal Disease). If you already have COBRA coverage when you enroll in Medicare, your COBRA will probably end. For more information give us a call at 866-445-6683 or contact us here.